Have you ever made homemade Chinese Take-Out? So much fun (and easy). Your family will be impressed. This was tasty and everyone (I mean everyone) cleaned their plate. 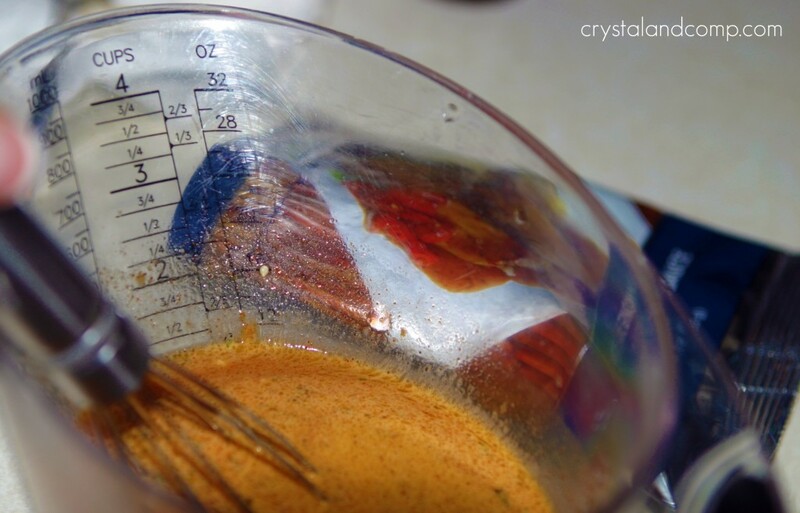 Start by mixing your packet of Sesame Ginger Mix from Rada with the 1 cup of water and sesame oil. There is something so wonderful about the smell of sesame oil. Yum! 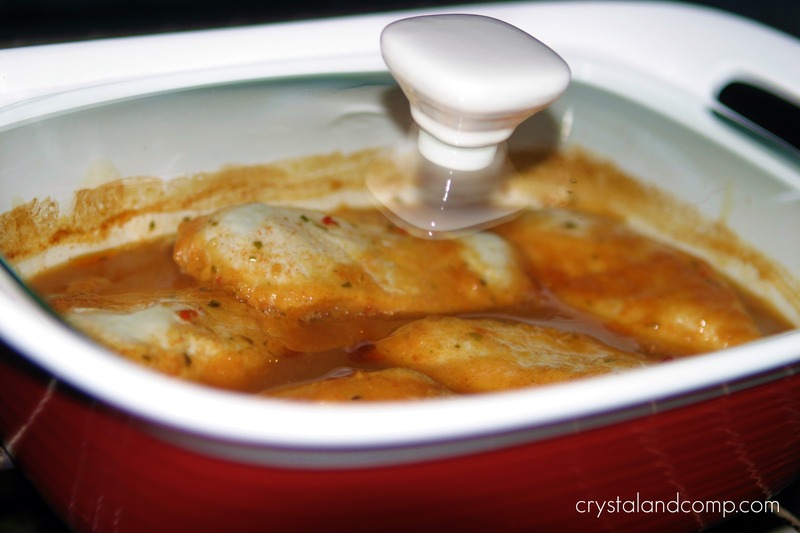 Place your raw chicken in a casserole dish. I used one of the new CorningWare casserole dishes my MIL gave me for Christmas. They are beautiful! 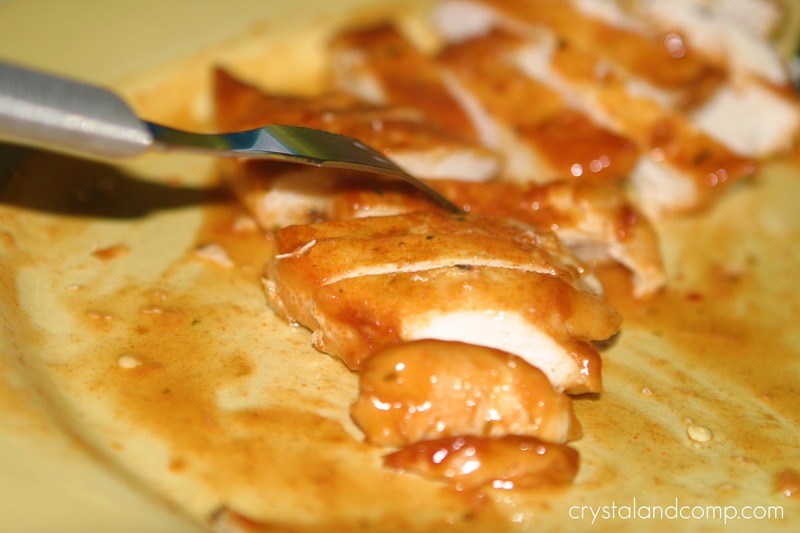 Pour the sesame ginger mixture over the chicken breasts and pop a lid on it or cover in foil. Place in a 350 degree oven. I cooked it with the lid on for 30-35 minutes. Then I took the lid off and cooked it another 20-25 minutes to brown the chicken a bit. The last 20 minutes of the chicken cook time I steamed a bag of mixed veggies (adding a little salt and pepper). 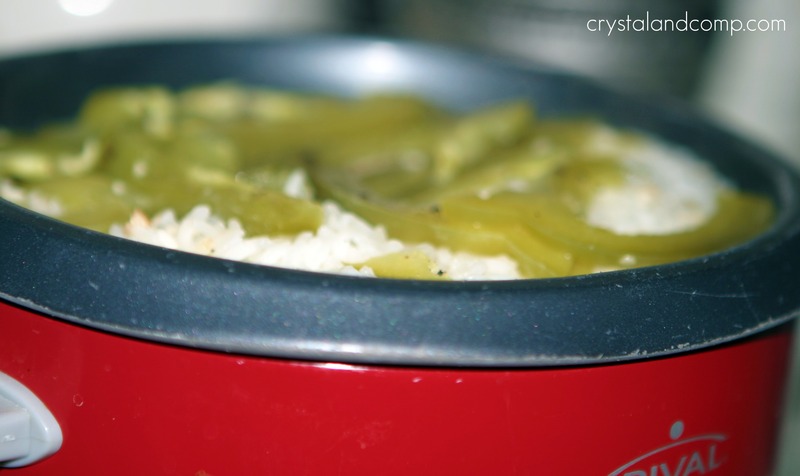 I also started my rice cooker and steamed some white rice. 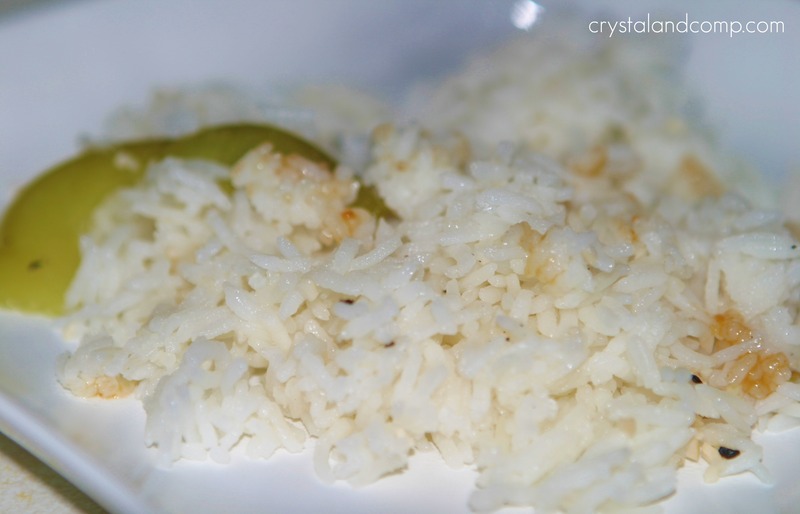 I added a bit of salt, a couple cracks of black pepper, a spoonful of minced garlic and half a bell pepper (sliced) to the rice and water before it started cooking. Once the chicken is done cooking it will look like this. Slice the chicken (or de-bone). I like to do this on a plate or cutting board. 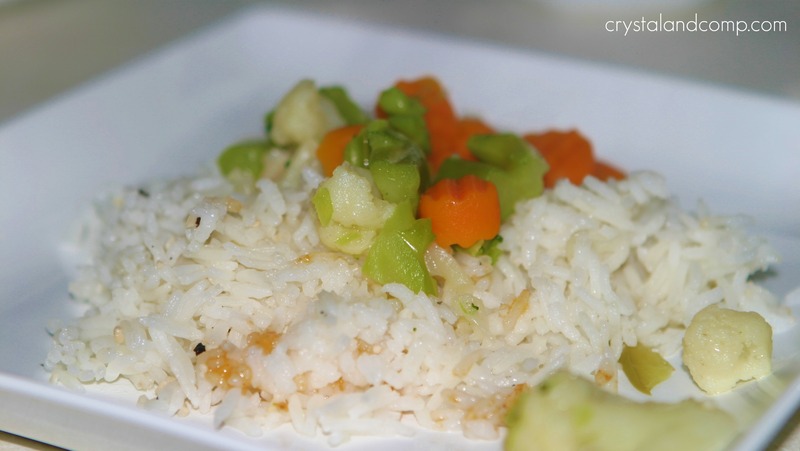 This is how the rice looked when it was done. Can you tell my rice cooker is a well used appliance in my home? Scoop a heaping of steamed rice and bell peppers on each plate. Top with some of the sliced chicken breasts and ladle some of the sesame ginger sauce left in the casserole dish over top. Shake on some sesame seeds if you have them on hand. If you are in need of more easy recipes, remember I have many here on my site. I am a busy mom too looking for dinner time solutions. And don’t forget I have pulled together a step by step tutorial sharing with you how to meal plan. 3 Boys and a Dog and I are working hard to bring you easy dinner ideas in 2012. Rada Cutlery is our sponsor for January. Did you know they have more than knives? They have many solutions for busy moms! 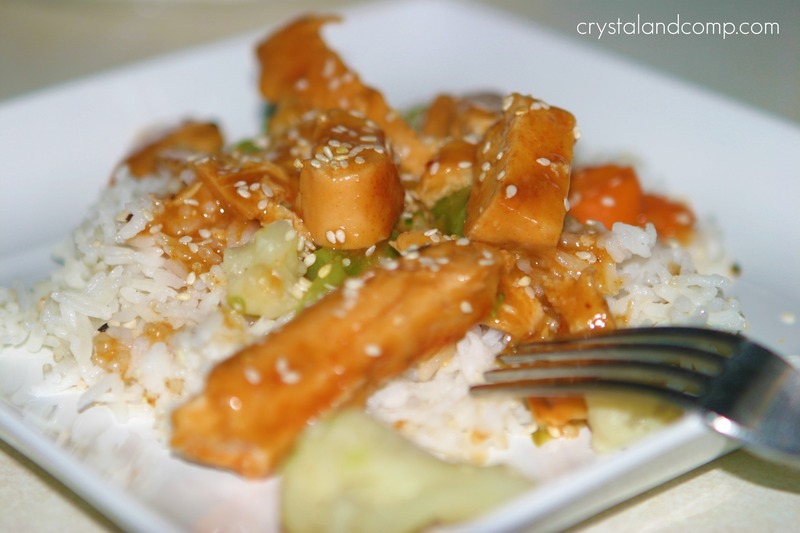 This recipe is made using a quick mix from Rada called Sweet Sesame Ginger Sauce Mix. A thrifty way to make take-out at home. 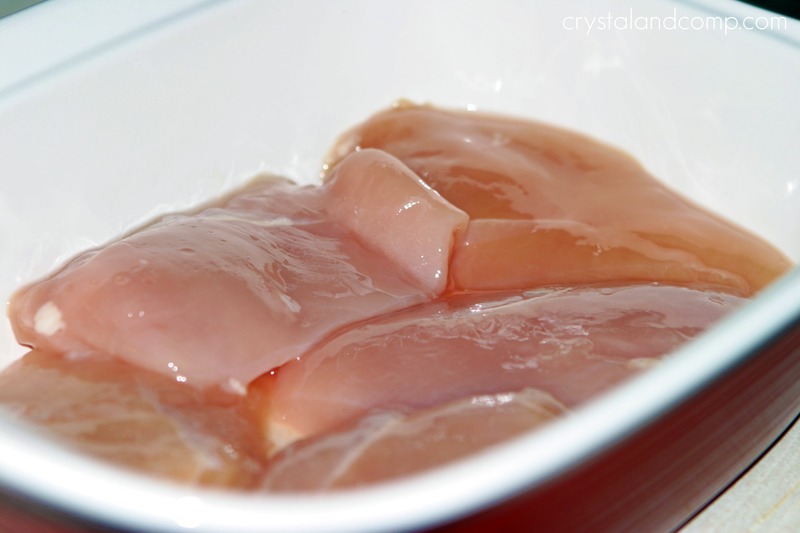 When the chicken is done, remove it from the oven and slice the breasts or de-bone chicken. Top with a spoonful of mixed veggies. 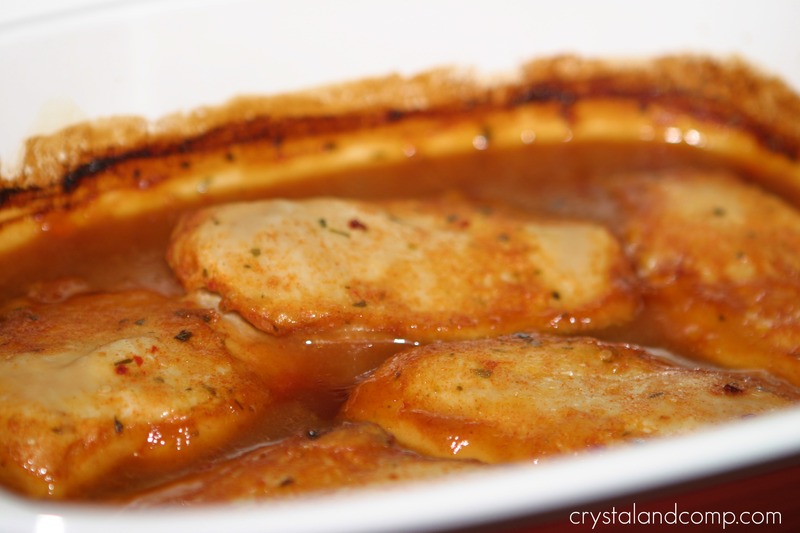 For more easy recipes visit https://www.crystalandcomp.com/category/recipes/. Yum, indeed. My family loved it and it really was so easy to pull together. Thanks for reading, Mrs. Jen B.
Virginia- that is an excellent dinner solution! This looks like a great dish. 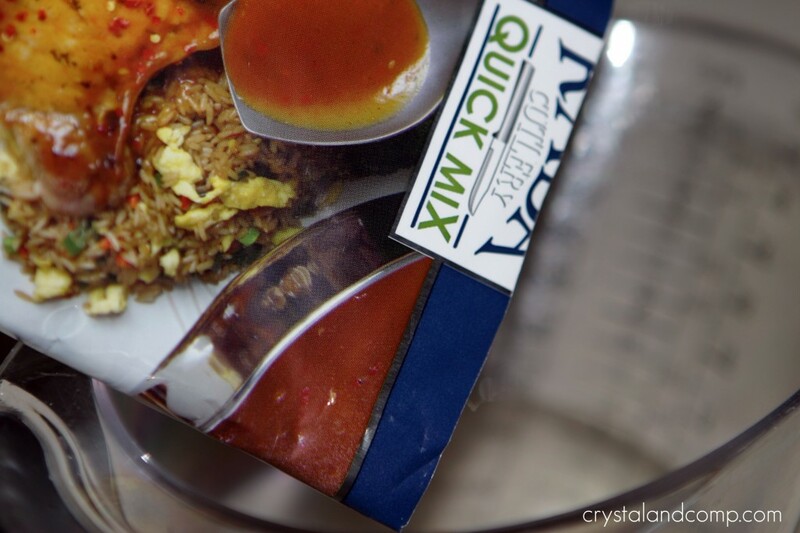 I have never used that quick mix, but I will have to give it a try. Hope you are having a great week end and thank you so much for sharing with Full Plate Thursday.